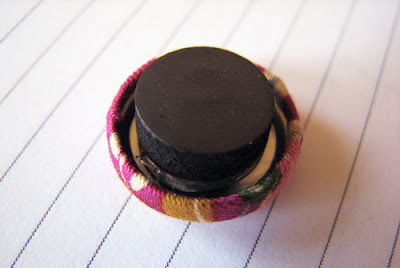 Some friends were over the other day, and I showed them how to whip up some fabric-covered thumbtacks and magnets. (See the tutorial here.) For the magnet version, you'd obviously glue on a magnet instead of a thumbtack. Those are too cute. I wonder if fabric covered bottle caps would work too! very cute and so much more interesting that a plain old magnet. I'm obsessed with magnets ... I buy 1" pins from etsy all the time, pull or cut the pins off the back and glue magnets to them. I've done the same with my commerative penny collection (you know those machines at touristy places that charge you $0.50-$1 to materially and irrevocably (yikes, spelling?) alter a penny to look like said touristy site?). Love them! 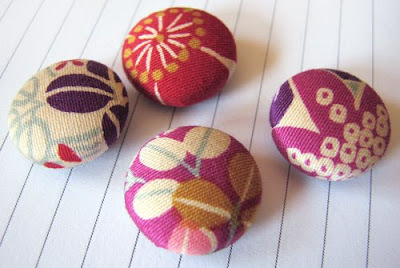 I made fabric thumbtacs and wished I could go on and on, but ran out of the buttons. Keep up the good work. Love your blog - you're an inspiration! Oh yeah! Super easy tutorial. I am so glad you posted the directions first then the pictures second -- it was instant knowledge for me, and usually it takes me a couple of readings to really "know" the directions. I can't wait to make some of these! oooh, how fun. I need to do this too! I've been thinking of doing just this. I've got a magnetic art strip that needs some pretty magnets to fancy it up. Your tutorial on thumbtacks is featured on Apartment Therapy again today, via Design Sponge. Jess, you're everywhere all the time! I have just come across your blog and its amazing - can't wait to start making a few bits!! Amanda, what would I do without you to tell me these things?? I had no idea. It is much cheaper to buy in bulk from coverbuttons.com, and you can get them without the little hooks on the back (which I normally have to remove with pliers). They have all different sizes. Cara, great tip! Thanks a ton! what a fun idea. I love finding ways to use scraps of fabric. I like to use them on my books! so fun! Those look great and would be perfect for using up the fabric scraps that I have lying around (just can't bare to throw them out). I made some hair clips using covered buttons but the hot glue didn't hold them on very well. What other glue would you suggest trying? Thanks in advance. This is just such a perfectly cute idea! It would make great gifts - especially dorm room gifts for family members that are heading off to their first year of college! Thanks so much for sharing! I'm looking forward to feeling less guilty about generating quilt scraps. The Buttons to Cover also make adorable earrings too. After covering them you simply use metal craft glue to attach an earring post (found in beading and jewelery departments) to the back, and voila! I have a lot of these kinds of earrings! I discovered these a couple weeks ago, and it inspired me to start an Etsy shop selling them! I hope you don't mind :) and over the next few weeks I will be working on expanding my shop inventory and gaining Facebook fans.